The main image is from Artistic Outpost's Hero plate. "Remember" is from AO's Playtime plate. 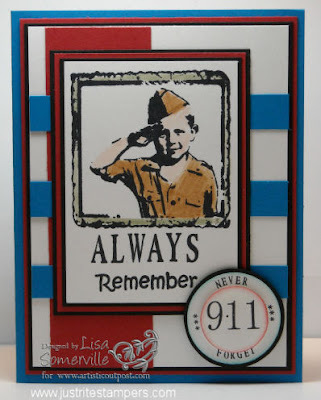 I used my JustRite Stampers to create the word "always" and "9/11"; the small words from JustRite to create "never forget". Lovely card Lisa. You know how I love this little boy too. beautiful...i lvoe that image - and the sentiment is perfect.